Offseason Primer: Who Needs a First Baseman Anyways? The Twins are still waiting for the official word from Joe Mauer on whether or not he’d like to continue his playing career, but anybody who saw the final game of 2018 knows the writing’s on the wall. And it’s in big, bold letters. Again, nothing’s been decided yet, but let’s just assume Mauer calls it a career. Then what? First base might be the one spot on the diamond in which teams can get the most creative. Just take a look at how a couple of the teams still alive in the postseason treated the position this year. The Twins Daily Offseason Handbook can be yours on this coming Tuesday if you preorder here for just $10. Not a lot of players who end up at first start their careers there. Mauer’s the perfect example of that himself. These days, it’s also becoming more and more common that teams use some kind of a timeshare at the position. There are a couple of good examples on teams still playing in October. Yuli Gurriel was the primary guy at first for Houston, making 99 starts there, but he also started 13 games at third base, another 11 at second and even made a start at shortstop. His flexibility helped the Astros cover for injuries to their other infielders and allowed slugger Tyler White to come up from the minors for regular time at first base. Cody Bellinger started 85 games at first base for the Dodgers, but he also made another 50 starts in center field, of all places. That allowed Los Angeles to find playing time for incredible diamond in the rough pickup Max Muncy and his .973 OPS. Muncy made 58 starts at first base. In Wednesday night’s NLCS game, the Dodgers used two different first basemen, neither of them Bellinger, and four different players at second base. That team has some pretty incredible flexibility. Keeping those two examples in mind, let’s take a look at how the Twins might fill the potential opening at first base. Taking a look back at 2018, the player with the most innings at first base behind Mauer was actually Logan Morrison. I guess it’s worth mentioning that the Twins do hold an $8 million option for LoMo with a $1 million buyout, but there are much better investments to be made. Tyler Austin was the only other player to see as many as 100 innings at first base for Minnesota last year. He showed impressive power, but he’s also struck out in 36.6 percent of his plate appearances in the majors. On the other hand, Austin has a .937 OPS against lefties, making him at the very least an attractive platoon partner. He played much more outfield than first over his minor league career, but Austin didn’t play a single inning out there in 2018. After Austin you’ve got Miguel Sano, who played 87 innings of first base this season. He’s certainly someone to keep in mind, but shifting him across the diamond just creates another hole at third base, which is already a weak spot in the org. With Jason Castro expected to return to health and Willians Astudillo establishing himself as a player of interest, there’s a chance the Twins could roll with three catchers next year. In that case, Mitch Garver could be a candidate for regular time at first base. He has some experience there. Max Kepler is a very strong defensive outfielder and hasn’t seen time at first since he played there regularly for Chattanooga back in 2015, but he’s a candidate. If Byron Buxton finds his footing and the Twins add another outfielder, Kepler could make a lot of sense as someone who forms a left-right platoon with Austin. Yes, Max did much better against same-sided pitchers last year, but his career splits still show a fairly significant split (.776 OPS vs. RHP, .605 OPS vs. LHP). Down on the farm, Brent Rooker is the big name at the position. It wouldn’t be a shock to see him knocking down the door next season, though he’s certainly not a realistic option for Opening Day. Zander Wiel isn’t as big a name in prospect circles, but he actually had a higher OPS than Rooker last year. Both Rooker and Wiel played quite a bit of outfield, as well. If you really want to go outside the box, LaMonte Wade played a lot of first base in his early years at Maryland, but he’s only played outfield these past four years in the Twins org. So, as you can see, even if we focus solely on internal options there’s no shortage of options. Since first base is the bottom position on the defensive spectrum, in reality anybody could be thrown out there. This is the first time in a very long time that the Twins (appear to) have an opening at first base. Mauer took the reins from Justin Morneau, who succeeded Doug Mientkiewicz. That’s an impressive run of stability — three guys covering 18 seasons — but my suggestion is to end it here. Don’t get me wrong, offensive upgrades are needed, but the front office should simply be focused first on adding a bat. They have enough in-house options and players with defensive flexibility to figure out positioning. How should the Twins fill the (potential) first base opening? They shouldn’t feel the need to. Offseason Primer: Can Minnesota Mimic Milwaukee's Success? If you like what you’ve been reading at the site so far, you’re going to LOVE the handbook. One of the key features included is a full organization depth analysis for not just first base, but every position on the diamond plus the pitching staff. Also included are profile on all the free agent options, a discussion regarding potential trade targets and much more. Click here for more on the handbook, a sneak peek at the cover and the list of special guest contributors. Austin, Garver, Sano, should rotate there. No to Grossman even being iyn the roster, please. I would not be opposed to adding a player, but I'd hope he has position flexibility. Let us not forget that before Mientkiewicz there was Hrbek. The Twins have a very long history of quality, defensive 1B. I absolutely do not want to dismiss the value of a quality glove at 1B! But you are correct that it is not the defensive value position of other spots on the field. Absolutely, I want the best defense on the field I can achieve. And a quality 1B, whether it be a hard stretch play or a foul pop up, can get extra outs. But really, 90% of the time, you need/want a guy who can simply receive the throw, not be caught out of position, and can properly handle the bouncer coming in from across the diamond. Two things you brought up really exasperate me; why, late in a losing season wasn't Austin used some in the OF to see how he could fit there in 2019 for lineup flexibility, (something I strongly believe in), and why in he'll was Grossman never worked at 1B? I'm not saying the Twins can't do better than Grossman, and I began a thread about this a couple weeks ago, but his best attributes as a hitter are working the count and getting OB. So when Mauer was out, wouldn't he have been a prime candidate to assume Mauer's role, both offensively and defensively? Or maybe they already looked at it during infield practice and just shook their heads and said no. For goodness sake, Denny Hocking played some 1B back in the day, and the Twins even played Adrianza some there. How could Molitor be forward thinking enough to put Adrianza at 1B but not try other positionally flexible ideas? (Sorry, rewind, and continue with future tense). I saw nothing from Austin to indicate he can't be a decent 1B. How well he hits, overall, will determine his spot in the lineup. His milb numbers, limited ML time, and brief tenure with the Twins shows, legitimate power. Even with slight improvement with the bat, he could be valuable and dangerous as a 5-7 spot hitter. Assuming for a moment we can take the whole of Sano, his ability, past production, etc, and assume for a moment he will continue his new dedication, I really like him at 3B. But he can also switch over to 1B once in a while, as be bas done before. As much as I like Kepler in the OF, there is also no reason be can't take his athletic ability to play 1B as well, though he would not be my first, much less 2nd choice. But I believe be could handle the spot, and I believe roster flexibility is important. We talk about Astudillo as a 3rd catcher. And I guess he is. But is that really what he is? He seems to be at least a decent backup catcher option. But he also appears to be servicable as a backup 3B/1B/corner OF option who may even be able to spot 2B. If Astudillo were to make the roster, Garver could fill in at 1B as well. We need to address the pen big time. We also need to address the infield with at least one major improvement, and at least another solid option. But I hope we can bring in a veteran bat. Hopefully one who can play occasionally in the field. Doesn't have to be a 1B. But someone who can allow Polanco to bat leadoff, or allow Polanco to continue hit in the 3 hole, ideally, between Rosario and Sano, and provide a dangerous presence in the leadoff spot. Wil Myers has had 3 healthy years out of 6. Myers plus for SanoAt 22 million a year Myers would be a money flush. I liked most of what DocBauer was saying.And after reading it thought, maybe the Twins should fire their Manager. I am taking a different approach to this winter.Don't have a clue what the FO should do, just know they should do something.Maybe even a lot! 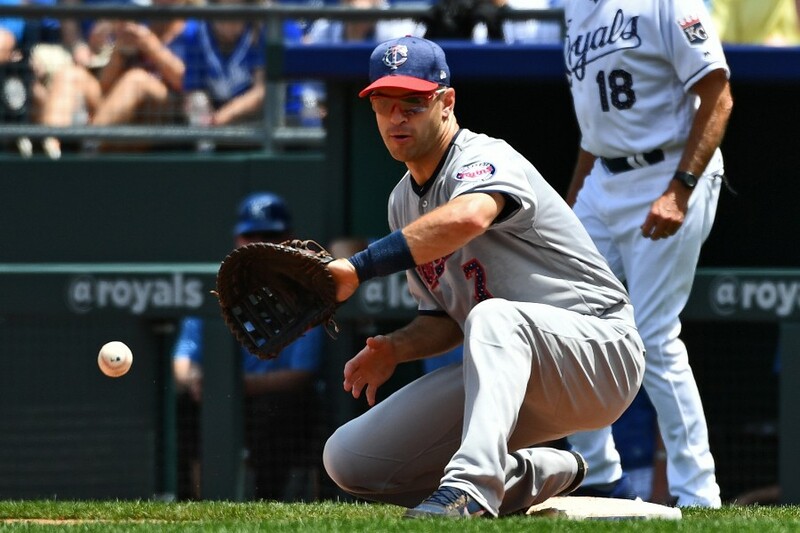 Although with Mauer it sure looked like the end, but after a month off will he decide to re-up for another year?The FO is actually kind of hog tied until he makes that decision...at least as far as first base is concerned. Trading Sano at this point is a terrible idea, especially for Meyer.Sano's potential makes it a no brainer to keep him and see if he is going to get on the right track.Also, his value is at an all time low.We need him to perform so he can either restore his trade value or prove he belongs in this lineup every day.Trading him at this point would be a terrible idea! Bring in a player that can hit 30+ home runs with 100+ RBI's.We don't always have to try to patch something together and hope it works.I know a bit of an exaggeration but my point is to get a great player not just someone who can fill in. If you had an Austin/Kepler platoon at 1B, when lefty Kepler is at 1B, lefty Cave can be in OF for Kepler, adding another lefty bat. In a perfect world, I would prefer Kepler stay in RF and that he hit .300 with 25 HR...(and Buxton would bunt frequently). No matter what they do they will get more production out of the position than in recent years. There was a six-year run in between that was mostly filled by Twins greats Scott Stahoviak and Ron Coomer. The decision on Mauer should not be with Mauer at this point.The FO is supposed to take charge of the team.If they want him back he will be back, if they do not want him back the decision should be out of Mauer's hands.At this point I would put Cave and Austin on 1B with Cave also as the fourth OF and if needed he moves in to regular OF rotation.Then as the season progresses it is up to Rooker to make the move, but I do worry that Austin and Rooker create another strikeout hole in the lineup. Call me crazy, but I think every team needs a first baseman, or a lot of throws will end up in the stands. I agree Tom, except I'd rather replace Grossman on this team as well. I'd rather look to fill any open roster spots with the best bat available, not the best bat who also plays 1B. There are enough 1B capable players on the team who are already going to be playing regularly. There was a six-year run in between that was mostly filled by Twins greats Scott Stahoviak and All-Star Ron Coomer. Although, he is so good that they named an entire Fort after him. The over under was 10, and I took the under. For a hefty sum. Took me 11 to think up the second sentence. The decision on Mauer should not be with Mauer at this point. The FO is supposed to take charge of the team. If they want him back he will be back, if they do not want him back the decision should be out of Mauer's hands. At this point I would put Cave and Austin on 1B with Cave also as the fourth OF and if needed he moves in to regular OF rotation. Then as the season progresses it is up to Rooker to make the move, but I do worry that Austin and Rooker create another strikeout hole in the lineup. Cave is barely 6’. Kepler is 6’4”. That is part of why he has been mentioned as a possibility. Much bigger target. He also has played a little at first in the minors and I believe once or twice in the bigs. As long as the Twins don't dink around with Logan Morrison again, I think 1B will end up OK. So, what is important for a first baseman...a BIG BAT (homers) or a great glove. They do have a need to hit, either for an above average average, or be a slugger of sorts. But what do you really need? First, you have to have a good idea of who is on second and what is at shortstop. What kind of glove do you need (and stretching power) to field plays from those positions at the bag...some of the time. Also, urability for the same reasons is a plus. For that reason alone, a first baseman needs to hold down the bag on a more than regular basis. Plus, so pitchers know how the guy will field the occasional pickoff throw, too. The Twins have: No one. Tyler Austin CAN play first, he's a good temporary fix. The Twins need to roster him in 2019. He can also DH and play some outfield. So look for him to make the team. Still not sure if he can hold down the position for the long haul. Same with Miguel Sano. The guy IS comfortable at third base, moving to first puts you in the game a lot more. Does he have it to do that, or will he be best served being a designated hitter where he can spend ALL his time on working on hitting and studying the pitchers. I ahd a thought of Max Kepler being the first baseman of the future. But at what point does a guy need time in training. He hits enough homers, his average is below average. But he has the make to be Dougie Baseball, which is fine unless you have a Justin Morneau in the wings. Is Brent Rooker that guy, or better served as a corner outfielder in place of Kepler out there. Rooker is the question. All of the above guys should be Minnesota Twins players in 2019. Probably all back in the fold the following season, too. So, barring a terrible terrible downslide (again) by Sano, Tyler AUstin being the Return of Kevin Maas or Chris Parmelee, and Max Kepler just being okay...we patch things for 2019 and look to see what Lewin Diaz and Luke Raley can offer to the mox. But then, we still have the question...I don't know, third base! So fill in until someone in the minors is ready?Cave, Austin, Kepler are not the players I would think of to replace Mauer.We may get a couple more HR's but we need way more than that.We need at least Rosario numbers there. Didn't we get a new stadium so we could afford a few high level talented players?Maybe there is no one to get or no one that will come to MN. → Article: Offseason Primer: Who Needs a First Baseman Anyways?